You know a country has nailed a dish when even after eating it every day while travelling you still crave it when you get home. And that is how I felt about ramen. Hot, flavoured soup and fresh handmade noodles was the best thing while travelling through Japan in winter and I still found myself craving back home in Sydney despite the heat. After having some of the best ramen in Japan, I knew I couldn’t just revert to the two minute kind so I googled best ramen in Sydney and the name Manpuku popped up a few times. 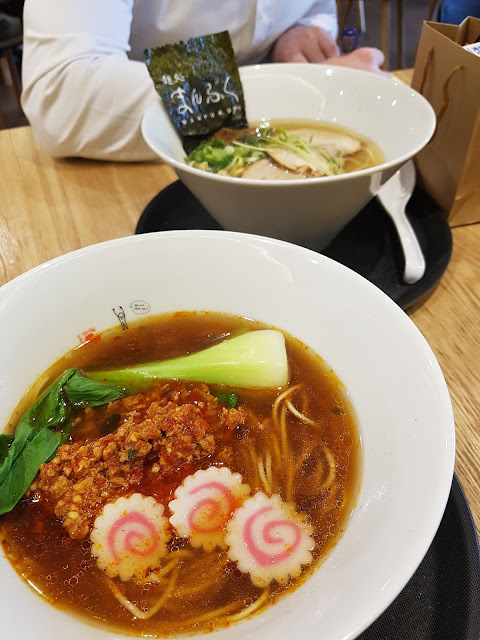 My boyfriend who had travelled with me in Japan felt the same way about ramen so we decided to make an occasion of it and try the Chatswood branch of Manpuku for our Valentine’s dinner. Thankfully the heat wave had passed by then and it was relatively cool for a Summer evening and my body was brewing a nasty cold so I was really looking forward to a bowl of soothing ramen. Manpuku is located a little outside of Chatswood’s city centre but is still only a 10 minute walk from the station. We arrived shortly after 6pm and being Valentine’s Day the patronage was mostly couples but it wasn’t too busy and we were seated immediately. Starving, we quickly ordered with my partner getting the salt based ramen and I got the spicy soy based ramen. By the time our dishes arrived, the restaurant was full. First I tried my soup; well-seasoned with a very very mild touch of spice then tried my partner’s soup which was a bit more of traditional broth. Then the next test- the noodles. They were definitely fresh and tasty but I would of liked them to be touch thicker. Overall the ramen was pretty good and was on par with what we had in Japan however we did find the serving size a bit small and partner left a little hungry so definitely don’t be shy to order some sides to go with your ramen. I haven’t tried enough ramen in Sydney to say it’s the best (if you have any recommendations please let me know!) but if you’ve got a craving for good ramen, Manpuku will definitely meet it.